Why Do Dogs Eat Poop?! | Scoop The Poop! Why Do Dogs Eat Poop?! I remember owning my beloved maltese, Ashley. To me, she could do no wrong until the day I actually saw her eat poop off the ground. It was a horror to me as a little kid. I just thought disgusting and that I must train her to not ever do that again. Well of course she did. No matter what I did, it was an issue. I have owned many dogs since then and witnessed my pets doing this as well. Then I got a cat, and noticed they would go into cat litter to do it too. That was the quickest lesson for me to clean litter box everyday. I have pondered this question through out life and have been given the same answers that many have. Your dog is bored and misses you, there maybe a lack of protein or iron, there may be something mentally wrong with my pet. What is it am I doing wrong I thought. Now I am a seasoned pet owner. I have consulted with veterinarians, vet techs, pet psychologists, friends, pet owners and other pet professionals. There is a reason why dogs like poops beyond being bored. 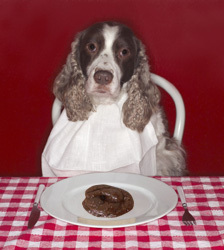 The likelihood is that different dogs eat different kinds of feces for different reasons. First, some coprophagy is probably completely normal. As everybody knows, dogs evolved from wolves – probably, current thinking goes, from wolves that spooked less easily than average. (1) Those not-so-spooky wolves got closer than others did to human bands and, later, human settlements. Finding human garbage and human excrement, the wolves chowed down. Eventually, there evolved an animal like the wolf, except that it was smaller, it hung around people, and it mostly scavenged instead of mostly hunted. Hey presto, the domestic dog, for whom it is normal to eat anything lying around that might have some nutritional value, including poop. Dog poop, cat poop, human poop and the like. From what I have been able to gather,feces probably attracts dogs because of food that is eaten with higher protein and fat. Cat food is higher in fat and protein than dog food, and consequently cat feces is too. As for why dogs like horse and cow manure and goose droppings, your guess is as good as mine. Dogs like plenty of things we humans don’t – when was the last time you rolled in a dead squirrel, grinning your fool head off the whole time? My best guess is that dogs just plain find feces tasty. In conclusion,having a dog to go all out to find poop to eat especially eating cat feces is not particularly good for the dog. The behavior is innately rewarding since the dog likes the taste, so you’re unlikely to solve it with attempts at training. The safest and best solution is to simply rearrange the situation so the dog finds it physically impossible to get to the poop. .Mmmm. I will have seconds please? Coprophagy is common in many species, particularly in young animals. I’ve seen both newborn horses and puppies eat their own poop. A few weeks ago my dog actually gobbled down some turkey poop! Gross! Thank you, I’ve just been looking for information about this topic for a while and yours is the best I have came upon so far. However, what in regards to the bottom line? Are you sure in regards to the source?|What i do not realize is in fact how you’re now not actually much more neatly-liked than you may be now. You’re very intelligent. Thank you so much for all of your comments. I am going to expound on the issue for you. You have expired me to write a second blog just for novices as you asked. I am not sure how many people know of this blog yet. So it helps that you are sharing my information with others. It comes with much gratitude on my part. Please be on the look out for a more detailed blog about this topic.